Program Contents: Pkg of 25, 8.5" X 11" six-panel foldout. • Increased educational growthand opportunity. • Increased focus in choosing a college major. • A better understanding of what one has to offer an employer. • A way to focus potential career options and find a job that matches one’s talents, abilities, and work preferences. 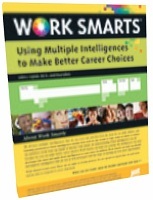 The Work Smarts can be completed in 15 minutes and is ideal for use as an occupational exploration and career development tool in high schools and colleges of all kinds. It can also have value in workforce programs looking for a holistic way to assess an individual’s occupational interests as well as their potential strengths as an employee.